Despite enjoying the occasional pint of Carlsberg Export I actually never bothered to look at them as a stock until pretty recently. Usually when looking at these types of companies the very first thing that I like to do is pull up a complete list of all of their brands which, in the age of the internet, can be found in the click of a button on their websites or even just from Wikipedia. It’s how I was a little bit surprised to discover that just three companies – Heineken, Anheuser-Busch InBev and SABMiller (soon to be part of Anheuser-Busch InBev) – controlled 40% of the world’s beer market and included a vast stable of brands, many of which I had assumed to be part of smaller independent companies. Carlsberg is number four in that group in terms of global market share by volume. Take the Hungarian beer market as an example, which is one I have a bit of first hand experience of. There are four main lagers in Hungary that are totally dominant in terms of domestic market share: Soproni, Dreher, Arany Ászok and Borsodi. Having always just assumed these were brewed by domestic companies it amazed me to discover that not one of them is owned by an independent Hungarian company. Dreher and Arany Ászok fall under the umbrella of SABMiller, Soproni is owned by the Hungarian subsidiary of Heineken and Borsodi is owned by Molson Coors (the second largest brewer in the US). Carlsberg’s own portfolio of beverages runs to a list of 447 names according to their website, with internationally popular brands including namesake Carlsberg, Tuborg, French beer Kronenbourg 1664 and Somersby Cider. Of the thirteen operating markets that make up their Western Europe segment (a total of eighteen countries) the company hold market leading positions in seven of them. All the Nordic nations and Switzerland are dominated by the group, with average market share of over 40%, along with number one market share in Russia and China. This is why the great alcohol stocks have been such terrific long-term investments: they have stable underlying businesses and are also inherently profitable year in year out. It’s also partly the reason why related beverage stocks Coca-Cola and PepsiCo have been among the best investments over the past sixty years. Again they both have very high levels of underlying profitability in a stable operating sector. If you compare the performance of the global beer quartet plus the spirit giants Diageo and Brown-Forman then you will find that Carlsberg has been among the worst performers since the turn of the century. In January 2000 you could have bought a share of Carlsberg for 215 DKK. Today it is worth 645 DKK. It’s not a particularly great performance compared to the benchmark OMX 20 in Copenhagen, and yet it does still manage to comfortably best the S&P 500 and Dow 30 due to the still lingering hangover (no pun intended) of the dot-com bubble. In addition to the 645 DKK that the shares are worth today, there is an extra 91.7 DKK to be added in dividend distributions, bumping the total return to 8% compounded annually. What if you reinvested those dividends along the way? In that case it boosts the total return to 8.7% compounded annually. Even though that extra 0.7% a year sounds small, on a sixteen year time frame it adds up to a difference of about $3,700 on a $10,000 initial investment. The wonders of compounding in action. There’s also something quite interesting in the fact that, since the turn of the century, even if you invested in the worst two performers of the group of six alcohol giants mentioned above – Carlsberg and Heineken – they would still have delivered you compounded annual returns of 7-8%. The thing is that underlying earnings growth has actually been pretty low over that time. In 2000 Carlsberg earned 14 DKK in profits per share. Sixteen years on and they are earning somewhere in the region of 30 DKK per share. So an investor would only have experienced annual earnings growth of 4.90% a year, largely due to Carlsberg’s positioning in the saturated European market (which represented 75% of total group revenue in 2015). The remainder of the returns come from dividends and, crucially, from an expanding valuation multiple. Back in 2000 you were only paying about 15 DKK for every 1 DKK in Carlsberg’s beer profits. Today the comparable figure is 21 DKK. It’s a great example of why adopting a sensible approach to value is important because eventually that multiple will contract again. Most of the beer companies and also Brown-Forman are trading at historically high valuations. 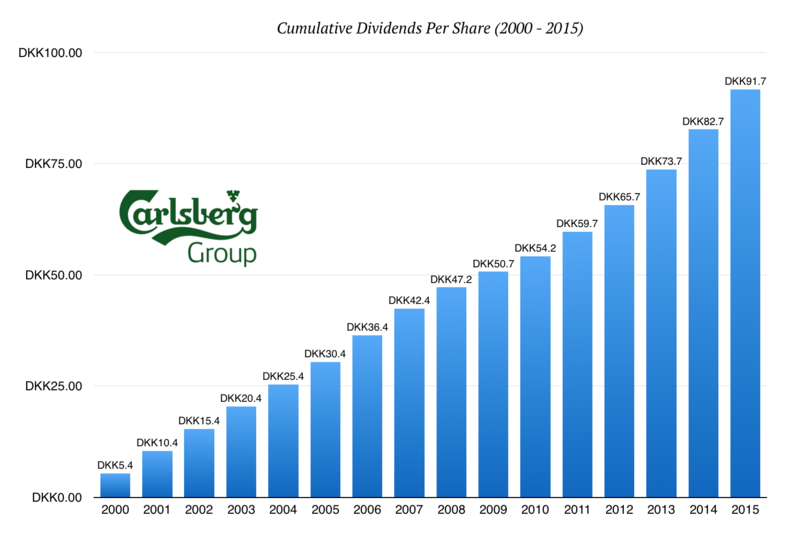 Carlsberg is at something like 21x earnings and 1.4% dividend yield. Looking at the other beer stocks you find Heineken trading at a similar valuation and yield, whilst Anheuser-Busch InBev is at 27x last year’s earnings but with a 3% yield. Moving to the two spirit companies you have Brown-Forman stock at an incredibly rich 30x last year’s earnings per-share and a 1.3% dividend yield. Only Diageo at 20x earnings, a 3% yield and the prospect of decent growth looks to be a safe play in today’s market. When the valuations start reverting to their historical means though these are a great set of stocks for dividend investors to own for the long haul. The chances are that they will still be pumping out dividend in a few decades time given the strength of their brands. In the meantime just sit back and enjoy the products. After all, there’s a 50% chance that your next pint will be adding to their coffers.